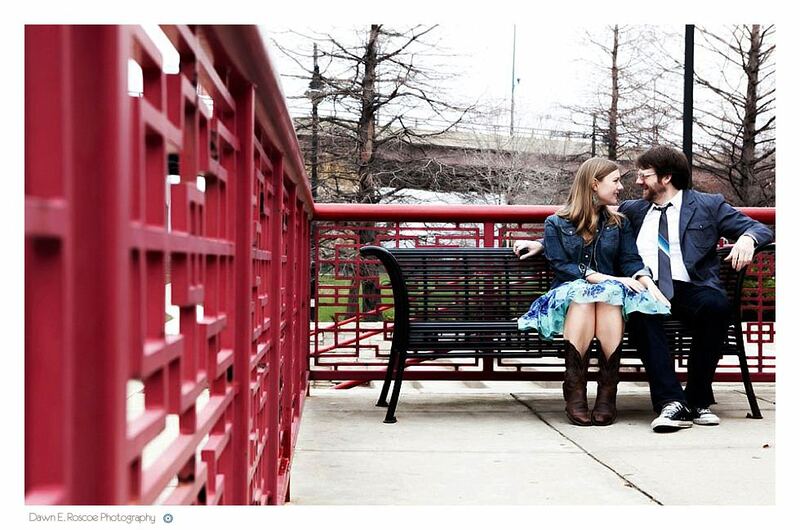 Every year I like to highlight my favorite Chicago locations for weddings and engagement sessions. This year, I wanted to do something a little different and do a “Best Of” feature. I have lived in Chicago for over 26 years and this city never ceases to amaze me with the every-changing urban landscapes, public art and lush parks. It seems that every year, locations seem to change- new murals and graffiti emerge, beautiful buildings are built and new neighborhoods are created. Being a wedding photographer, I always have the unique privilege of visiting old locations and discovering new locations. So, here are my “Best Of” locations for photo shoots, or just hanging out and enjoying the surroundings. For me, North Beach offers the best skyline view. North Beach is at best for early morning or sunset photo sessions. During the summer, North Beach is full of volleyball players, beach-goers and joggers. So, North Beach is best for engagement sessions during the summer and weddings during the Spring, Fall and Winter seasons. North Beach is pretty empty all year round, except for the summer months, and is my go-to location for my couples’ who love the city skyline. I am pretty partial to Montrose Harbor on the north-side of Chicago because I used to live in Andersonville and Montrose Harbor was a mere 10 minutes away and a lovely oasis when I wanted to enjoy the Chicago skyline and lake. On summer weekends, the harbor is pretty full with people enjoying the lake, but for the rest of the year, Montrose Harbor is empty and offers a city landscape with a prairie-like bird sanctuary (see below). 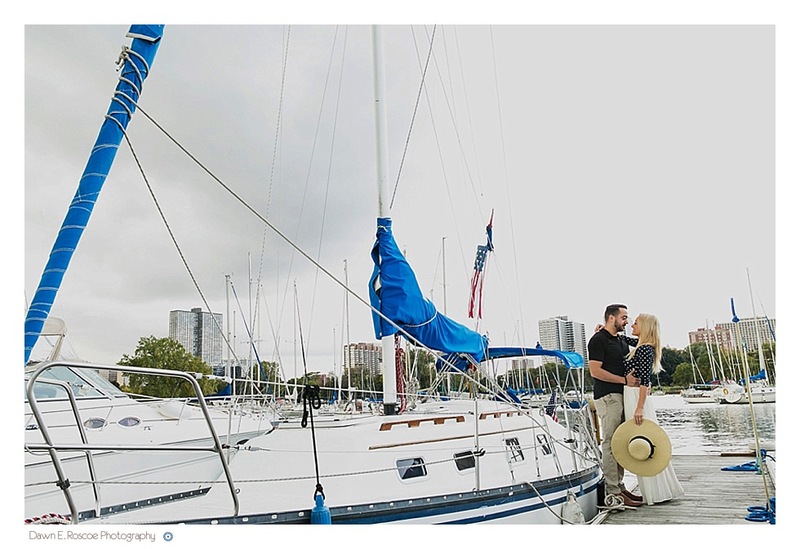 I love this spot all throughout the year and for every season, Montrose Harbor is perfect for couples’ who love boats, Chicago skyline and the outdoors. On the east side of Montrose Harbor, lies a beautiful bird sanctuary full of green prairies, colorful flowers and dense trees. My favorite season to shoot is during Fall in late October, when the leaves are the most robust. This place is so quiet and I hardly ever run into other wedding parties or other photo shoots in the area. All year round, this place ranks as one of my favorites because of the beautiful and vast backdrops in the area. 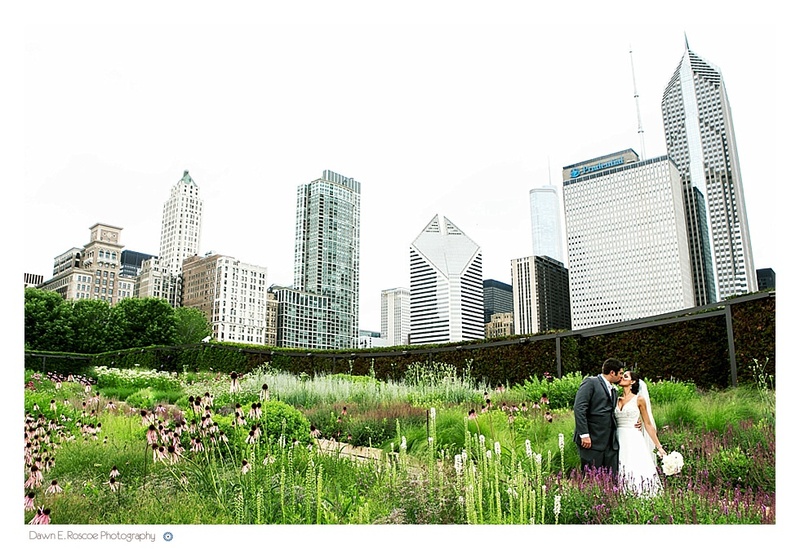 Located right around the corner from the Bean, Lurie Gardens is a lovely oasis from all the Millennium Park crowds and tourists.The gardens are best during the summer and hidden from the rest of the park, not many people know the gardens are even there. 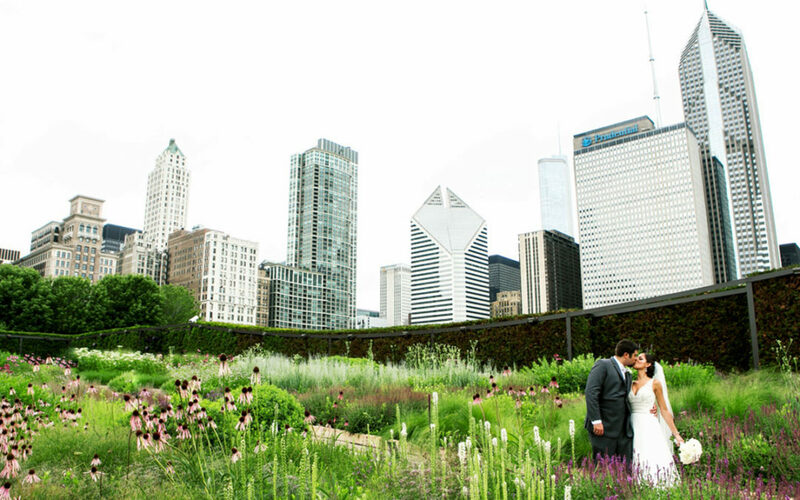 This location is great for couples’ who are having their weddings within walking distance from Millennium Park including venues and hotels on Michigan Avenue. 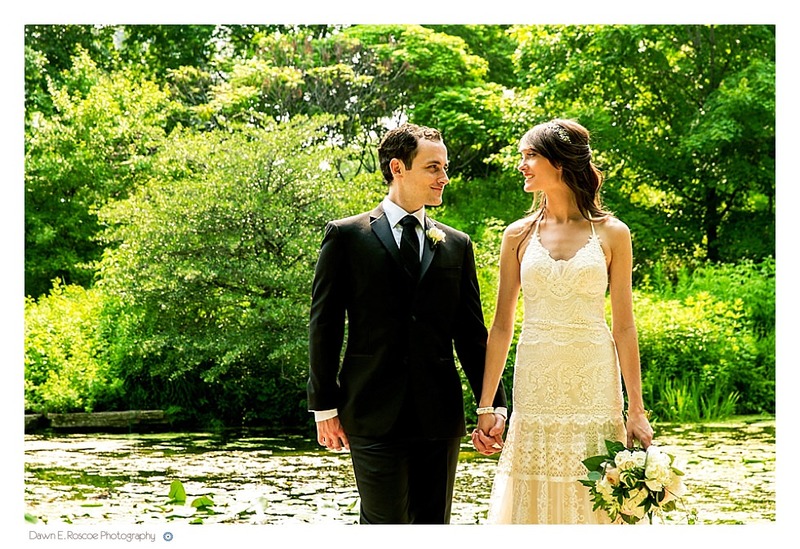 I love this location because it offers beautiful greenery and a scenic cityscape all in one! The Lilly Pond is a gorgeous park on the north end of the Lincoln Park zoo, and one of my favorites in the city for vibrant green garden landscapes and a very secluded space among busy Fullerton street. The Lilly Pond closes around Thanksgiving and reopens in the Spring and best during the Summer and Fall months. The garden is wonderful for weddings on the weekends, along as there are no weddings on the premises. 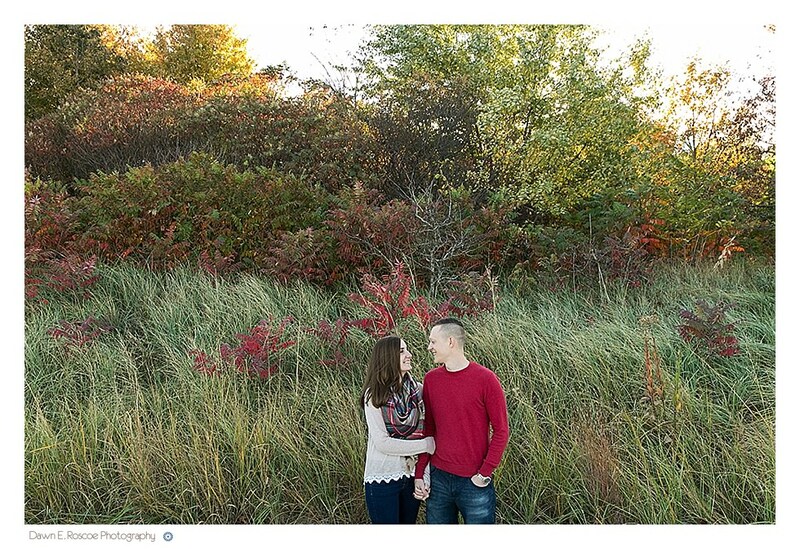 During the week, this place is perfect for engagement sessions a bit before sunset. Chinatown is becoming one of the best spots in Chicago for restaurants, shops and a great cultural experience. Chinatown is absolutely wonderful for engagement sessions during the day and fun for weddings that are located on the south side. The image above was shot in Ping Tom Memorial Park near Chinatown and one of my favorite urban parks in Chicago. Chinatown is a fabulous place for couples’ who love the “off-beaten” path and want unique backdrops for their pictures. I pretty partial to this location, because it’s my new neighborhood! But seriously, Pilsen is my new location for artful murals and industrial backdrops. 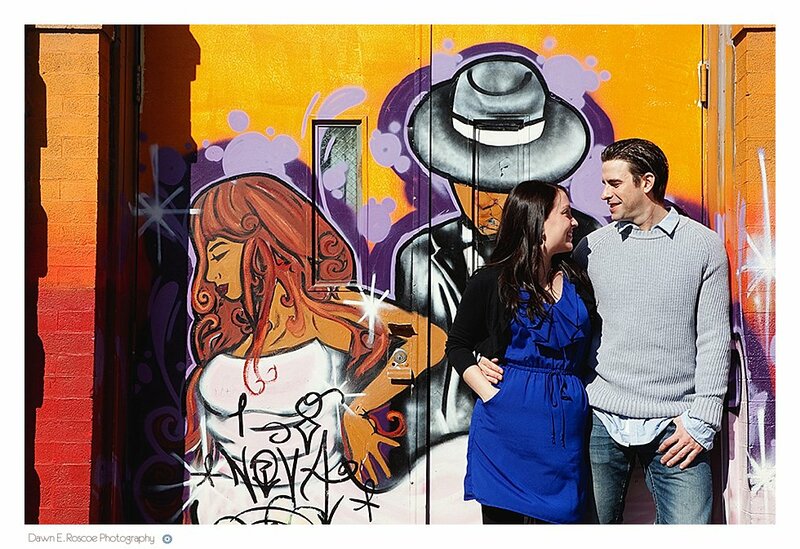 All over Pilsen, there are murals, gardens and buildings that offer a never-ending array of wonderful locations for an engagement session or wedding near the south side of Chicago. My favorite spot is right along 16th street and the 18th street bridge is one of the best Chicago skyline spots in the city!